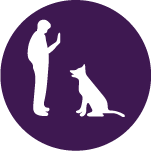 6-Week Tricks ONLINE Program — is a 6-week, online class that culminates in your dog testing for a nationally-recognized trick dog title. 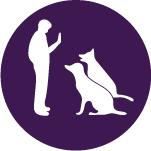 The program will consist of weekly-video postings for you to watch at your convenience, with a few new tricks to teach your dog over the following 7 days. During the 6-weeks of videos you will learn 18-20 tricks which is more than the 15 tricks you and your dog will need to perform to test for your trick dog title. This will allow you to pick the tricks that work best for you and your dog. At the end of the 6-weeks you will record a video and upload it to a private web address for Crystal to evaluate and verify the completion of 15 novice-level tricks performed. Once this is accomplished you will earn a Novice Trick Dog title from Do More With Your Dog!, the official sanctioning and organizing body for the sport of Dog Tricks. This is for the individual or family that is ready for a dog but not sure which to choose. Ruff House can help you choose a dog that will fit best with your family and lifestyle. We can make breed suggestions, evaluate a litter or test a dog’s temperament before you adopt, rescue or buy. We can meet you at the local humane society, pound, rescue or local breeder. 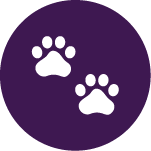 Owning a dog is a big responsibility and we can help you avoid additional problems and frustrations. Come join our family as we enjoy a nice hike in our beautiful desert surroundings. Your Dog(s) must be people and dog social. This is a free event, we just want to enjoy spending time with you and your dogs(s) doing something they love. Email crystal@ruffhouse.biz to RSVP and we will tell you where to meet up for the hike.